The Living Consciously story is a result of founder Coach Steve Toth's personal awakening and journey. Although he had been successful in the corporate world for decades, his life began falling apart as a result of living an unconscious life of addictive behavior, self medication and ignoring what really mattered to him. He lost his marriage twice, everything that mattered to him, and found himself in financial disasters. When he reached rock bottom, he knew if he was going to survive he had to change his life radically. He let go of everything he had and started listening to an inner inspiration that was emerging out of his desperation. He confined himself to a small studio space for several years, where he poured all of his energy into creating Real Coaching Radio-TV Network now known as Conscious Evolution Media. And in the process, he was recreating himself as well. The Living Consciously show is a further expansion of Conscious Evolution Media and Real Coaching Radio-TV Network, and evolved from Steve's personal journey of coming into consciousness and his passion for living a more conscious life. Show Plot: To bring a higher level of personal consciousness into the world by discussing and demonstrating what consciousness looks like and feels like when people show up aligned with their Truth (what they see and feel) and express it in their moments of truth. Our show is designed to experientially demonstrate what is possible when a team of consciously oriented professionals from various areas of life are connected to their truth and then to each other in a dance of consciousness and personal power. The show’s basic premise is to create a conscious dialogue with leaders in various fields to discuss how to live consciously within their particular area of expertise and passion with a focus on seeing, feeling and understanding the bigger picture of Energetic Reality in terms of where we are now in our transformational journey to raise human consciousness! 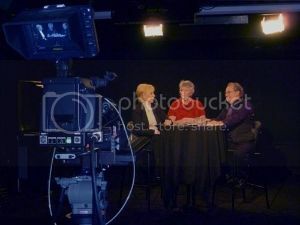 The show goes live once a week from either CEM’s Network-Internet-TV Studio on YouTube Live or in our Denver Cable TV-Studio on Comcast Cable with Coach Steve Toth as the Host-Moderator, three expert Cast Members and a Guest-Cast. The Guest Cast and the Cast Members use different tools and modalities on the show from their own practices to steer themselves and the Team Cast to maintain the cast’s ability to stay conscious of Energetic Reality as it pertains to human functioning and dysfunctioning. I love it! It excels in many ways. I love it! It excels in many ways. That's no surprise. Everything you and your crew do has been very good for a very long time. The new site will certainly expand the ranks of the many of us who have already benefited from your work. Congratulations! Your contributions on Living Consciously TV! Thank you for the opportunity to be on your show. Your topics and questions are bringing attention to important areas of our lives. What a treat to share the stage with these great insightful luminaries on the most important topic of elevating self-esteem! Thank you for having me Steve. The show was great and I really enjoyed discussing love with all of you. Thank you Steve. I had a great time and your other guests were fantastic. You're all my kind of people! Thanks for the links. I will spread the word. I recently had the pleasure of being on a panel with like-minded woman, moderated wonderfully by host Steve Toth on Living Consciously TV. Focused on the topic of positivity, I found the interactive conversation to be engaging and enlightening. I am increasingly thankful for Conscious Evolution Media for being a conduit for sharing information that results in providing the tools to assist us and help us live in a world full of light and love, instead of fear and uncertainty. We can all benefit from what Steve and his team has to offer. Much applause and thank you! Dear Steve – thanks for a great show yesterday. What a fantastic group of people! It was great fun being on the show and talking about The Truth about Time Management Myths. We had some interesting discussions and I hope people walk away understanding that Time Management doesnt have a whole lot to do with time at all. I thank you and your team for having me on the show. Steve, it was such fun being on the show. I learned a lot from both you and Lynda. Her work is fascinating, especially because I do similar work with students. I didn't know anything about your past until I read what's listed above. It's fascinating to me to hear about the journey of others. Thanks so much for including me on your show as we all journey toward expanding our awareness by expressing more love and generosity through frontal lobe activation. Thanks Steve for another delightful experience. Your co-hosts are terrific. I didn’t know there were going to be others. Very, very rich! Blessings to you and Nan, and I look forward to next time. I loved the panel and had a GREAT time on the show :-) "Believe and you will achieve greatness." What an excellent goose-bump-filled conversation that was! What an excellent goose-bump-filled conversation that was! Thank you so very much to all of you! What an amazing time and open conversation. Totally liberating to discuss the fact that we are all human. I enjoyed the no judgement zone of the show. It is my hope that more of these types of conversations can be had and that we delve deeper into the many facets that makes us who we are. I always enjoy being on the show as a guest host so please have back! It was delightful to spend a very fast hour with you and your lovely colleagues. You made the interview spectacular. Let's follow up. I hope the response is a resounding success. Thanks everyone... I had a wonderful time and I love your show format. Lynda sorry you had the challenges with your internet and sorry we didn't get a chance to connect.